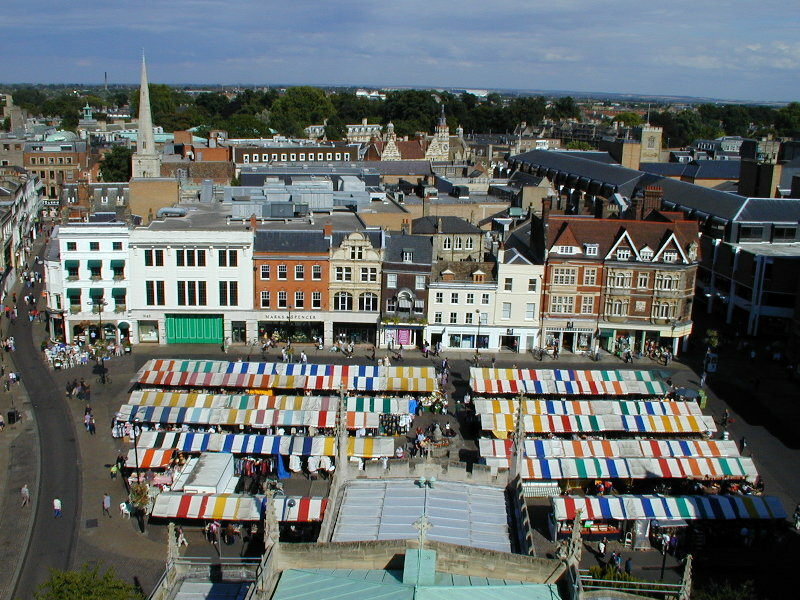 This is the view east towards the market square, including Don Pasquale restaurant at the left, and to the right of that Marks and Spencer and then at the right more shops. The church at the left is Holy Trinity and the church at the right is St Andrew the Great. In between the two can be seen Lloyds TSB bank. The large complex in front of St Andrew the Great is the Lion Yard shopping centre. To the left of Holy Trinity is the former Heffers stationary shop. On the horizon in the middle of the photo is the Grafton Centre and to the right of that a large Cambridge airport building. At the left on the horizon is the chimney stack of the Cambridge Museum of Technology.